Jenny and I had met over Twitter about four years ago when I was tweeting from my feed @ProfShakespeare about her father’s many contributions to Shakespearean theatre and offering numerous links to interviews and film clips. I had also tweeted about her brother Ed Hall’s amazing work as director of Propeller Theatre, whose all-male production of The Taming of the Shrew had greatly impressed my students and me in 2008. So, when Jenny said a few months ago that she wanted to start teaching her father’s verse-speaking methods, I convinced her to try a workshop with our students. Of course, it helped that Jenny and I shared a California connection—I grew up in Los Angeles and she lived there as a child when her mother the actress and dancer Leslie Caron was working in Hollywood. 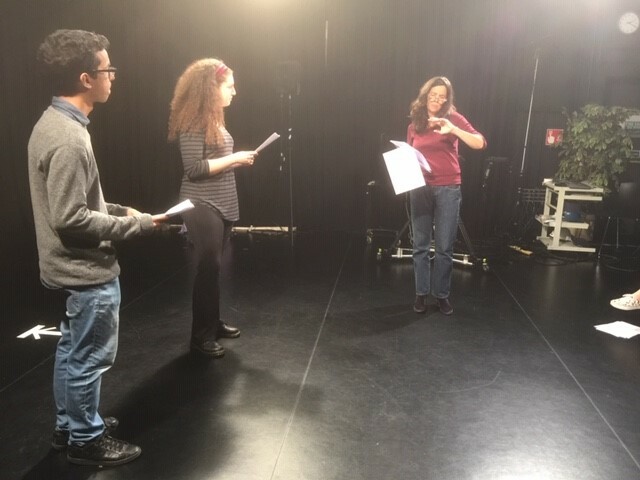 Neither Jenny nor I had ever run a practical workshop solely on verse, so we decided to recruit a few students, hire a film studio and camera operator George Ormisher and technician Christopher Bacon in the Minghella Building and see what happened over two hours. Fortunately, Sir David Bell had awarded me a grant from the Vice-Chancellor’s Endowment Fund to cover the Minghella filming costs and Jenny’s preparation and work. So, Jenny and I and the students, Maria Ieridou, Raj Khan, Natasha Clarke, Millie Farquhar, Tzeitel Degiovanni, Emily Johnson, Eleanor Dewar and Lauren Collard, all turned up on September 28th at 1pm not quite sure what we were going to do. But within a few minutes, Jenny masterfully explained that her method of speaking verse had been developed by actor-manager Thomas Betterton in the 17th century and then passed on to such later actor-managers as David Garrick, Charles Macready, William Poel, Dadie Rylands and her father and then to her. Jenny also discussed how she thought that she knew Shakespeare’s language while performing in major productions at the National Theatre until she was directed by her father, who showed her how much more command she could have of Shakespeare’s verse. In the workshop, Jenny began working with students on passages from Henry V, Twelfth Night, A Midsummer Night’s Dream, Hamlet, Romeo and Juliet, and The Tempest. As you can see from the clips on YouTube, students who were hesitant at first quickly gained in confidence as Jenny showed them the rhythm and pace of the verse and how to hold the last syllable at the end of a line. As the workshop went along, I also added commentary on my own research and publications into how Shakespeare composed his plays in manuscript form and then transmitted them to the actors and the censor and finally to theatrical audiences in the 16th– and 17th-centuries. When the workshop ended, not only were the students and I impressed but so was George the camera operator, who, it turns out, is an actor with a special interest in Shakespeare. 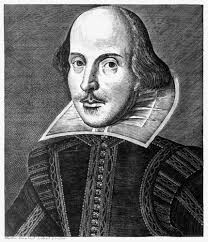 So we all felt that we had learned quite a lot from each other about Shakespeare’s language and plays. I can honestly say that Jenny taught me a great deal about language that I thought that I had understood but clearly had never considered. Jenny recruited her husband Glenn Wilhide, a film and television director and screenwriter, to do the post-production editing of the film clips, so their quality is much better than in the usually grainy clips posted on YouTube. Jenny has scheduled another workshop, for which I am applying for further funding, to be held in December in a replica of an Elizabethan theatre in a film studio in London. If we get funding, we plan to hold auditions and a rehearsal in late November. So, although we may still be occasionally tripping over our tongues rather than speaking trippingly, we are very excited about the learning opportunities offered by this truly collaborative workshop series.